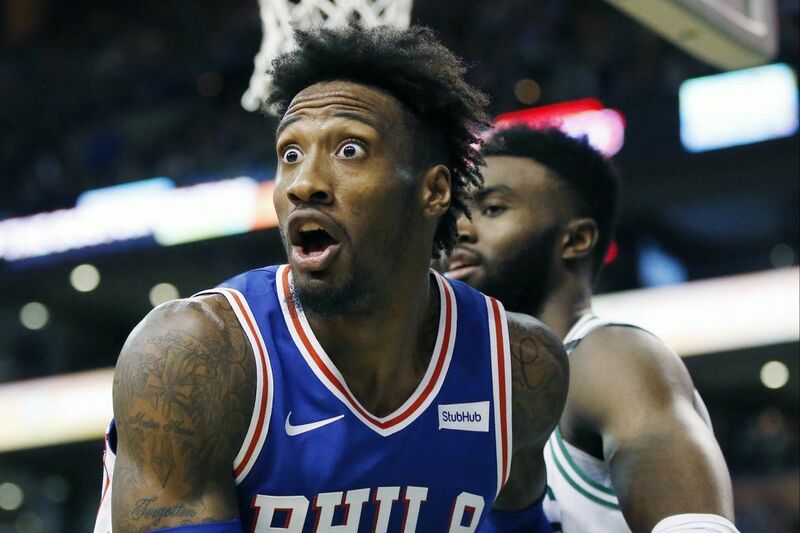 The 76ers' Robert Covington reactiing to a call during the third quarter. BOSTON – Here are my key takeaways and "best" and "worst" awards from the 76ers' 89-80 victory over the Boston Celtics on Thursday night at TD Garden. — The Celtics didn't show up to play. It was as if they didn't think this game counted. Kyrie Irving, Boston's NBA All-Star Game starting point guard, was sidelined with left shoulder soreness. Without him, the squad was a turnover-prone shell of itself. — Even though the Celtics provided little resistance, Joel Embiid showed the versatility that made him an All-Star Game starter. He finished with game highs of 26 points, 16 rebounds and six assists. The center also had a team-high two blocked shots. — As bad as the Eastern Conference-leading Celtics (34-12) played, this was still a good victory for the Sixers. A win is a win, and this was their second straight against one of the conference's top two teams. Prior, they defeated the Toronto Raptors, who at 30-13 are second. — T.J. McConnell is blossoming into the scoring threat off the bench that the Sixers need. The reserve point guard had 15 points after scoring a career-high 18 on Monday. — Robert Covington needs to shoot more. Five shots in 40 minutes, 12 seconds — that's unacceptable for the "Three and D" guy. — Best performance: It's hard not to give this to Embiid for the second straight game. He was dominating. — Worst performance: I didn't want to do it. But I had to give it to Covington for basically being M.I.A. on the offensive end. The Sixers small forward scored five points on 1-for-5 shooting, missing 3 of 4 three-pointers. — Best defensive performance: This goes to Jayson Tatum. The Celtics rookie small forward had two steals and two blocks. — Worst statistic: This goes to the Sixers' committing 25 turnovers. — Best statistic: You have to give this to the Sixers' shooting 88.2 percent from the foul line (15 of 17). — Worst of the worst: This goes to the sloppy play. It was unwatchable at times, as the teams combined to commit 44 turnovers.